Tap into your inner Trickster! 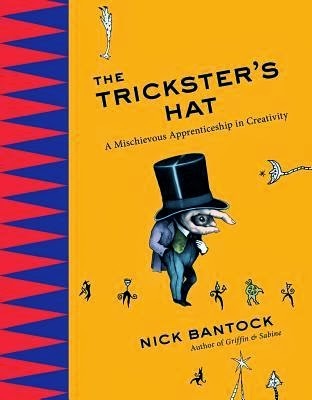 About The Trickster's Hat: A Mischievous Apprenticeship in Creativity by Nick Bantock: The act of creating art, in all its forms, offers us a path to our souls. But the path can be confusing, and getting lost along the way is inevitable. However, maybe that’s the point. 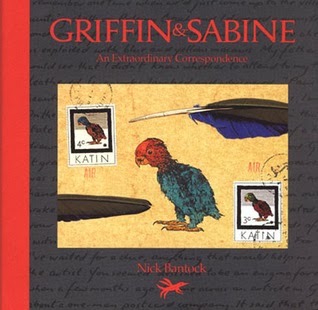 In The Trickster’s Hat, bestselling author of the Griffin & Sabine cycle Nick Bantock invites you to lose yourself in order to become a better creator. Inspired by Nick's popular and mischievous workshops, the book's forty-nine perceptive exercises will encourage you to forget your destination while you meander through the wondrous world that awaits you in the periphery of your mind's eye. If you’re willing to be lead hither and thither down unlikely paths by a fellow of dubious reputation, if you’re prepared to keep a sense of humor and not be phased when he plucks the unexpected out of a mischief-stuffed hat, if you’re ready to zigzag, detour, and wander in search of a better understanding of your artistic core, then, let the Trickster be your guide. Well, I can. And you can too. The Trickster's Hat is probably going to be the closest thing I can get to participating in a Nick Bantock workshop. This slim volume is like having Nick Bantock guiding you though creativity lessons or prompts (like writer's prompts) in 49 exercises. They start off very simply and progress to the more daunting; but they are always, always encouraging. I quickly realized when I started "reading" this book that I wouldn't be able to complete the exercises as I was reading. These exercises beg for attention and concentration. To fully benefit from these mini art lessons, I suspect that it would take me a few months! The lessons Bantock imparts span the obvious art basics. But while I thought this would focus on collage creation (a natural logic because that's what Bantock does so well! ), he crosses over and back from the visual to the verbal -- there really is no divide between the two. He in fact stresses using both sides of the brain and get them "talking"! These lessons are fun, sometimes funny, and even a little unconventional (at least compared to the few art lessons I've had!) . But what I truly appreciated are his words of encouragement to find things that inspire, to innovate and try new (and old) things, to shake out of mental ruts or blocks, and cultivate a creative and uninhibited attitude ... because only then can one create and enjoy the process of creation! This is a book that highlights the adage that "Life is a journey and not just a destination." The attitudes and processes that an artist has and goes through are just as important as the art they create. This book has cemented my appreciation for Nick Bantock's work and I am grateful that he has decided to share his gift of creativity through this lovingly packed volume. I submit to his apprenticeship willingly! Uh-oh: This book contains the trademark Bantock art but the artwork is not in any way related to the exercises and are there more for inspiration. There is a bit of a disconnect there but it doesn't detract in any way from the exercises and was probably done intentionally to prevent people from imitating what's there. My disclaimer: I've read the book but have only worked through 3 of the exercises. I plan on working through this book for the rest of the year! Verdict: Tap into your inner Trickster and get cracking on your own journey to self-discovery towards greater creativity under Nick Bantock's tutelage! A beautiful book with easy-to-follow exercises that will inspire, energize, and encourage you to create beautiful things. I highly recommend this for artists and artists at heart, Nick Bantock fans, and anyone with a willingness to open themselves up to their own creativity. I received a copy of the book through Penguin.ca's Bloggers and Books Network in exchange for an honest review. Thanks so much, Elizabeth! This looks like something I must have! I read 'The Happiness Project' a while back with a read-along and this definitely fits in with my goal of giving myself permission to enjoy the journey without worrying about the results. Thanks so much for hosting, April! I think Nick Bantock did an amazing job with this and will no doubt inspire many. What a great idea to incorporate it in your Happiness Project goals. Have fun!